I came home from the office with good intentions. A couple of hours in the studio. A late yin yoga class. Bed by 10:30. I missed the yoga class. Became so engrossed in creation, time passed unnoticed. That’s not at all a bad thing, other than I didn’t give my body the attention it deserves. Dang. How easy it is to lose that balance thingie when I become singular in my attention. The real mess up, though, came in my creating. Took it over the edge of what pleased me into that place where I kept hemming and hawing about what to do to bring it back into balance. I didn’t really want to go back in and rework it and I definitely didn’t want to paint it over or throw it out. I actually didn’t even want to not like it, but I didn’t like it, and I couldn’t ignore my feelings nor my thoughts no matter how hard I was trying to pretend it was ok.
My gut speaks loud in those instances where I am attempting to accept the unacceptable and make it ok. I didn’t always listen to my gut. Now I do. I painted over the page I was working on and let it dry. It is one of the greatest lessons in painting, and life, that I hold true. If you don’t like it, paint over it. Painting over it doesn’t mean I have to get rid of everything I’ve done already. It just means, creating a clean slate while allowing some of what was there to show through, to be part of the underpainting of what is happening now. We are still weaving our tapestry of life. We can repair and recreate into our own unique design. Nothing is really lost. Be kind and careful with your tapestry. Have faith that you can bring new life to it. We are always weaving into our life, threading moments that inspire and moments that conspire to pull us out of the light. It is in our capacity to find the value in each moment and thread that through our needle that creates the difference between a life lived as a daily grind, or a life expressed through moments that take each breath away. I was fascinated last night by my capacity to let go of being in the moment, going with the flow and trusting in the process. In my forgetfulness, I became rigid in my thinking that I knew what I was doing. In thinking I ‘knew’, I didn’t allow space for my intuition, my creative muse, my source to guide me. See, the reason the page went over the edge is because I wasn’t paying attention to being in the creative process. I was paying attention to the act of creating. That space where me, myself and I, compel me to get busy doing the act of creating and not be One with the art of creating. In that space of pushing and pulling and wanting to make it happen, my need for perfection, my need to ‘make it look smart’, make it appear clever, overtook my soul’s desire to simply be present and flow with the process. In each of our tapestries there are moments of wonder and awe and moments of’ “really? what was I thinking?”. Finding the value in all things, allows us to thread our needle with purpose and allow the design of our tapestry to be a unique expression of our lives. Categories: The Creative Journey | Tags: art journal, Benjamin Zander, creating value, Finding your middle ground, learning from my mistakes, painting over, Val Boyko | Permalink. I love those moments of: REALLY? And I love those moments where we connect and see into our hearts and know — we are all connected! Hugs — so lovely to see you. Your journal postings are beautiful and compelling. Thank you for the share Louise! I love how you brought in Ben Zander’s “How Fascinating! !” I use it too…. I also love his one buttock piano playing metaphor for being ready in life! I can also relate to what you are saying. Something happens during creativity when our ego can slip in unnoticed. From creating and being in the flow we somehow become focused on the outcome. We move from our inner expression and play to thinking and critiquing. We become attached. Our ego takes over. Thank you for this wise, inspiring and fascinating post, Louise! And thank you for sharing your fascinating light Ann! Ha Ha ha! I get it! Perfect example of just letting go and allowing. This was a perfect metaphor. We do tend to beat ourselves up over the smallest of things. I call it Negative Ego (or Nego for short). It is not our friend. It lies to us all the time. It tells us it’s great when it’s not, not great when it is, and a whole lot of shoulding on us! I have done a course on this Nego of ours and the identifiers. It is based on the info from the Lazaris Material. We are so multi-faceted. Fascinating! Hi Louise, I’ve just been finding out about this Art Journalling and it sounds wonderful! Good for you. I love this post. How we accept and perceive our creations isn’t unlike our tapestry of life. 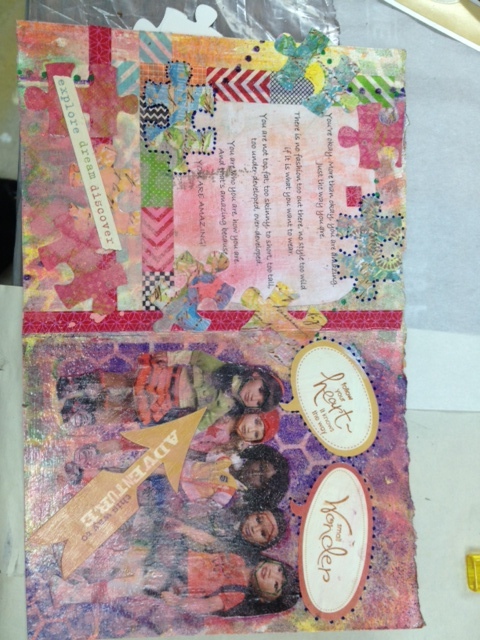 So true Lisa — and art journaling is fabulous — I’m really loving it! And thank you for the award. I shall drop by tomorrow. Hugs. What a blessing you are. That critter often forgets that true inspiration has no goals. I’ll tell him to leave you alone if you tell him to leave me alone. In one of the tributes to Maya Angelou this week, I read this quote from her. I think it fits in with what you are saying. Inspiring as always, Louise. You’re so right there is wisdom in stepping back and giving yourself grace. Lovely post.